This post is in honor of my first follower, Ashley of Eisy Morgan. 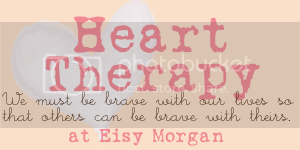 She has started 'blogging therapy'...a link party where you can either take her prompt and write a post or share a post that you've already written that shares your heart. I'll be joining this inspirational idea as much as I can! This is the second week and the prompt is to share what you're thankful for. •I'm thankful for ladies like Ashley who inspire me and others. •I'm thankful for the person who invented blogging! •I'm thankful I live in a country where I have freedom of speech. •I'm thankful for blogging friends. •I'm thankful for a Godly heritage. •I'm thankful for a Savior. •I'm thankful for the Holy Spirit. •I'm thankful for the founder of my church, Opha Carney...she was a trailblazer!... and her legacy! •I'm thankful God is moving in my church, we are merging with another church in town and have changed our name from Miracles of Faith to Current Church...and we now have a West campus AND an East campus!! •I'm thankful to be a servant of the Lord. •I'm thankful God uses everyday stuff, like the trash, to show me Him and His ways. •I'm thankful for my family, even though we are getting older and having a hard time with how time can change things. •I'm thankful for my in laws, they did give birth to my Hunkie! •I'm thankful for my husband, who God brought to me...I didn't have to use a dating site or have friends set me up! •I'm thankful that Hunkie is an awesome provider, he works way too hard for us! •I'm thankful for a miscarriage, it made Heaven sweeter and me stronger in the Lord. •I'm thankful for my almost 2 Lil' Hunkie, and his unconditional love. •I'm thankful for Lil' Hunkie's laugh...it's music to my ears! •I'm thankful Lil' Hunkie got his Dada's brilliant blue eyes. •I'm thankful I get to stay at home with him. •I'm thankful for a home, not just a house, a home...even though we need a bigger one. •I'm thankful for true friends. •I'm thankful for tradition, old and new. •I'm thankful for makeup and hairspray! •I'm thankful for seasons, all of them! •I'm thankful for cheesecake. Mmmmm. And now I'm thankful to be linking up!